Reigate Community Festival was held at Reigate Priory Park on Saturday the 4th July this year, with a Medieval theme to celebrate the 800th Anniversary of the signing of the Magna Carta. 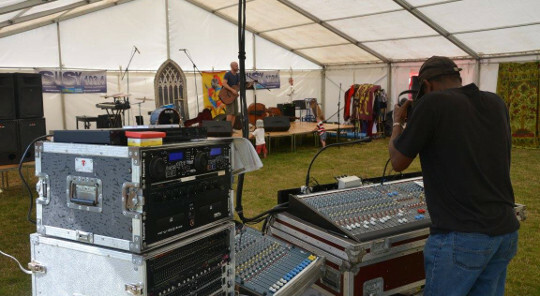 Begun in 2009, it’s reportedly “the most well-attended event in the town, attracting upwards of 5,000 visitors and 100 stands”, ABC were delighted to supply the festival’s music tent – a simple 12m x 30m marquee with plenty of space for the stage, a buzzing audience and the sound man, and – in between acts – a perfect shelter for those who may otherwise get too much sun on the day. There was lots to see in the Arena too, from falconry and dancing displays to “Tug o’ War” and the Strongman Tournament! Plus of course, the funfair and craft and food stalls, including a delicious looking the cupcake stand. We at ABC Marquees are always happy to provide great service, but it’s extra special when the whole community is involved, and even nicer when we receive kind words following the event.